Avoid Snacking: Now that you are eating for two it can be tempting to indulge in a late night snack. If possible fight the craving because it often leads to uncomfortable heartburn as you are trying to relax in bed. 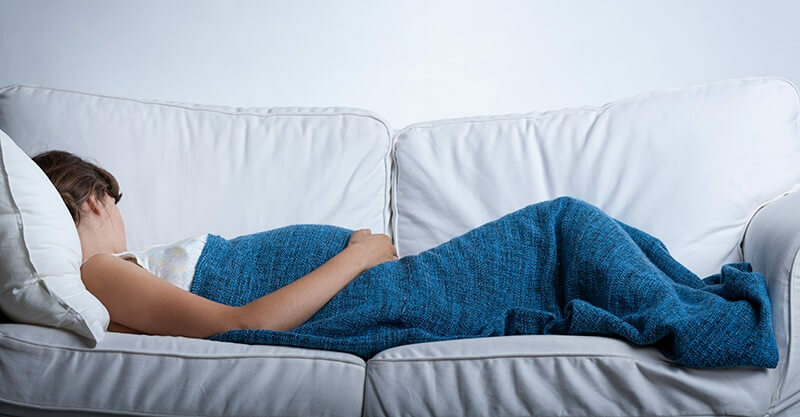 Sleep on Your Side: Sleeping on your side can help you relieve pressure on your abdomen, breathe easier, and avoid the backaches that are common during pregnancy. Sit Up: Using a firm pillow to prop your head and upper body up a few inches can help you breathe easier as you sleep. Get Active: If you find that you can’t sleep don’t just lie in bed tossing and turning. Get up and do some kind of mundane activity like folding laundry or putting away toys. These simple tasks can help relax you and distract you from your sleep troubles. Make Your Bed Comfortable: A comfortable bed is even more important when you are pregnant. Do whatever it takes to make the bed more relaxing, from adding pillows to getting a new comforter. You should also keep the condition of your mattress in mind. Turn Down the Temperature: Pregnant women have a tendency to run hot which can make the bedroom feel stuffy at its normal temperature. Consider setting your thermostat a few degrees cooler. Put Yourself in Sleep Mode: A few minutes before you go to bed set aside all distractions. This includes books, TV, and your cell phone or tablet. Eliminating external stimulation can make it easier for you to fall asleep. Use the Bed for Sleeping Only: It is tempting to use the bed to get work done, to fold laundry, or to make crafts. Limiting it to sleeping only can help signal to your body that it’s time to rest when you climb into bed. Eliminate the Light: Your bedroom should be quiet and dark. Make sure the curtains are drawn, turn off the TV, and cover up any illuminated clocks you have. Since sleep is so important when you are pregnant, the imminent arrival of a baby is a great time to consider upgrading your mattress. You are going to relish sleep as soon as the little one arrives, and having a new mattress is a great way to help you rest faster and for longer. Download our free eBook to learn everything you need to know about finding the right new mattress.